Home »BBQ Seasoned Chicken 16 oz. »BBQ Seasoned Chicken 16 oz. BBQ Seasoned Chicken 16 oz. 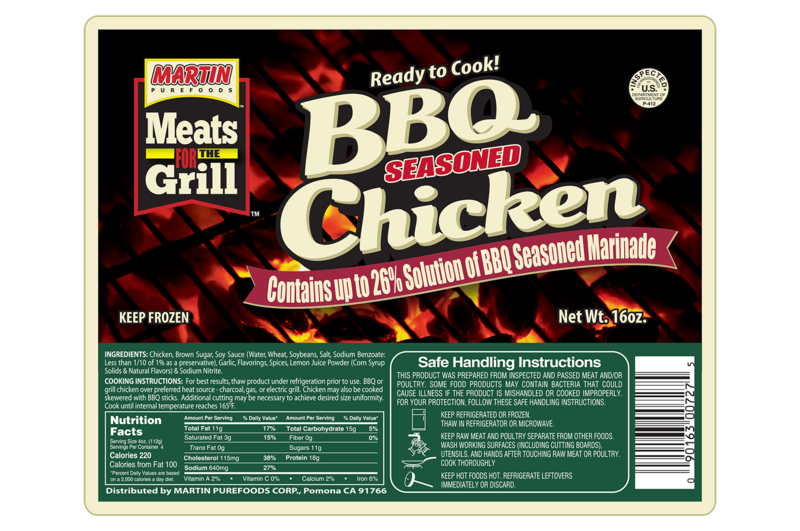 INGREDIENTS: Chicken, Brown Sugar, Soy Sauce (Water, Wheat, Soybeans, Salt, Sodium Benzoate: Less than 1/10 of 1% as a preservative), Garlic, Flavorings, Spices, Lemon Juice Powder (Corn Syrup Solids & Natural Flavors) & Sodium Nitrite. COOKING INSTRUCTIONS: For best results, thaw product under refrigeration prior to use. 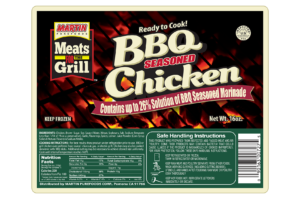 BBQ or grill chicken over preferred heat source – charcoal, gas, or electric grill. Chicken may also be cooked skewered with BBQ sticks. Additional cutting may be necessary to achieve desired size uniformity. Cook until internal temperature reaches 165°F. ← Previous Previous post: BBQ Seasoned Chicken 16 oz.